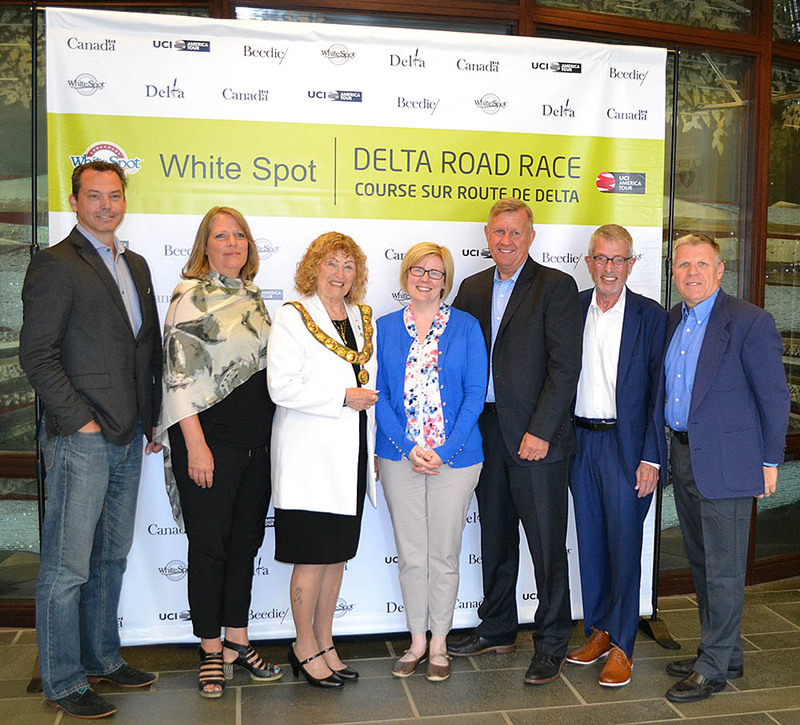 On Tuesday, the Honourable Carla Qualtrough, PC, Minister of Public Services and Procurement and Member of Parliament for Delta, announced the awarding of a $50,000 hosting grant from Sport Canada to the Tour de Delta, which includes the UCI 1.2 White Spot | Delta Road Race. From left to right: Mark Ernsting, Tour de Delta Race Director, Erin Waugh, Executive Director of Cycling BC, Her Worship Mayor Lois E. Jackson, The Honourable Carla Qualtrough, Minister of Public Services and Procurement and Member of Parliament for Delta, Warren Erhart, President & CEO, White Spot Hospitality, Councillor Robert Campbell, Liaison to the Tour de Delta Board, Master of Ceremonies, Ken Kuntz, Director of Parks, Recreation & Culture. "We are grateful to our wonderful sponsors and volunteers, who have helped the Tour de Delta become a mainstay summer attraction in the community," said Mayor Lois E. Jackson. "Through this $50,000 hosting grant from the Government of Canada, the Sport Canada Hosting Program, and Cycling Canada, we can continue to make this phenomenal event a success year after year." The grant is a tremendous contribution to the overall growth of the UCI 1.2 White Spot | Delta Road Race, which was won in 2017 by American veteran rider John Murphy (Holowesko-Citadel p/b Arapahoe Resources). Three-time USA national champion Kendall Ryan (Team TIBCO - Silicon Valley Bank) won the White Spot | Delta Road Race on the women's side last year. "This funding is critical to ensuring our elite and upcoming Canadian cyclists have the opportunity to compete in a high-quality event with a high-quality field of competitors. This level of event is crucial to their development and allows us as a nation to garner valuable international ranking points with home field advantage. Cycling Canada wishes to express our sincere thanks to Sport Canada for the grant and the City of Delta for hosting a remarkable and long-lived event," said Cycling Canada Cyclisme President John Tolkamp. The purpose of the Sport Canada Hosting Program is to assist sport organizations in hosting international sport events in Canada - which the White Spot | Delta Road Race is considered due to its UCI status. "Races that attract the attention of the very best riders need financial support. The Sport Canada Hosting Grant announced here today will help to ensure that the White Spot | Delta Road Race continues to be a destination race on the North American circuit," said Cycling BC Executive Director Erin Waugh. The Hosting Program also delivers economic, social and cultural benefits to Canadian communities like Delta. "This grant helps more than just cyclists' development. It has allowed Delta to host a UCI Caravan Driver Training course locally that allows our provincial car and motorcycle drivers to continue to enhance their caravan driving skills," said Tour de Delta Race Director Mark Ernsting. BC Superweek is Canada's biggest professional road cycling series and features more than $140,000 in prize money with nine races over ten days. BC Superweek runs July 6 - 15, and is made up of the Tour de Delta presented by Beedie (July 6 - 8), New West Grand Prix (July 10), Global Relay Gastown Grand Prix (July 11), Giro di Burnaby presented by Appia Development (July 12), PoCo Grand Prix presented by Dominion Lending Centres (July 13), and Tour de White Rock presented by Landmark Premiere Properties (July 14 - 15).